Just updated/cleaned and extended the survey and forward rate data used in Chinn and Frankel (2019) (discussed in this post). Here are preliminary results regard forward rate bias, both pre- and post-crisis. Consider the regression: st+3-st = α + β(ft,t+3 – st) + ut+3 Where st is the log spot rate at time t, ft,t+3 is the log forward rate at time t for a trade at time t+3. Then OLS estimates of β are illustrated below for the early period up to 2008M05 (starting in 1986M08 for advanced currencies except euro, and 2001M10 for others), and late period from 2008M09 to 2018M05 2017M09. 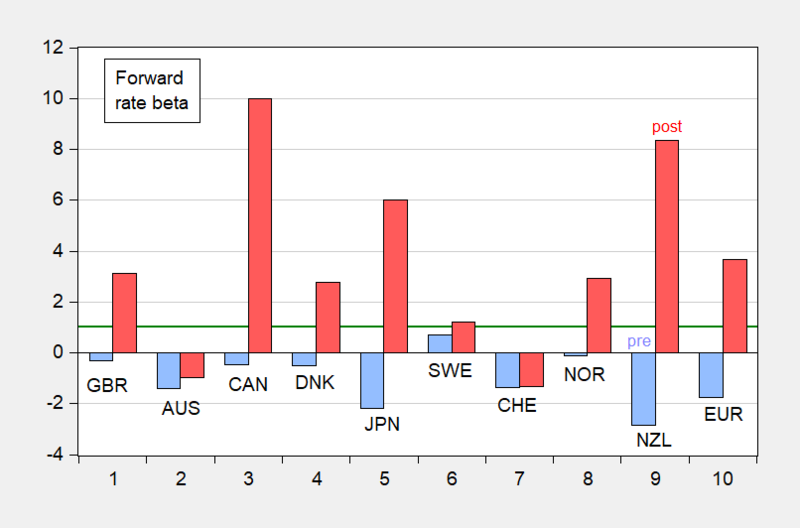 Figure 1: β estimates from pre-crisis (blue bar) and post-crisis (red bar), using 3 month ahead forward rates. Green line at value of 1, implied by unbiasedness hypothesis. Source: authors’ calculations. Just updated/cleaned and extended the survey and forward rate data used in Chinn and Frankel (2019) (discussed in this post). Here are preliminary results regard forward rate bias, both pre- and post-crisis. Where st is the log spot rate at time t, ft,t+3 is the log forward rate at time t for a trade at time t+3. Then OLS estimates of β are illustrated below for the early period up to 2008M05 (starting in 1986M08 for advanced currencies except euro, and 2001M10 for others), and late period from 2008M09 to 2018M05 2017M09. Figure 1: β estimates from pre-crisis (blue bar) and post-crisis (red bar), using 3 month ahead forward rates. Green line at value of 1, implied by unbiasedness hypothesis. Source: authors’ calculations. 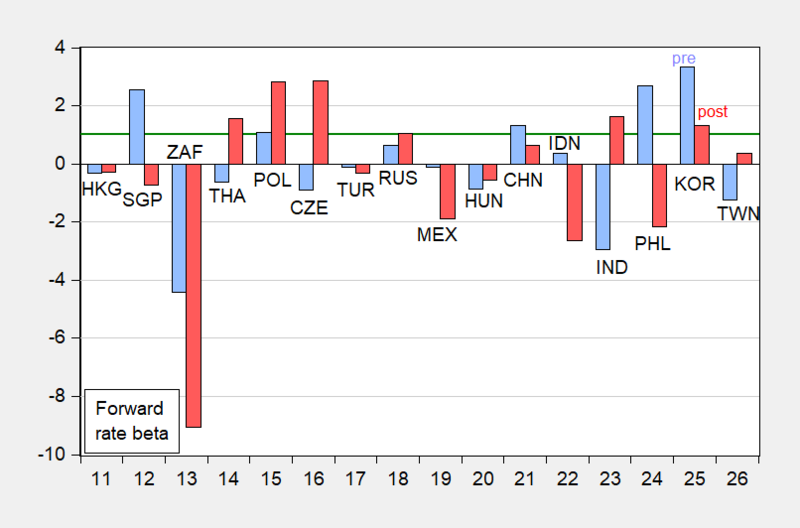 Figure 2: β estimates from pre-crisis (blue bar) and post-crisis (red bar), using 3 month ahead forward rates. Green line at value of 1, implied by unbiasedness hypothesis. Source: authors’ calculations. Notice that in Figure 1, focusing on advanced country currencies, slope coefficients are typically positive in the post-crisis period, while negative in the pre-. This result is consistent with the findings in BCFH (2018), discussed in these posts , , and at VoxEU, to the extent that covered interest parity holds. In Figure 2, much more varied experiences are recorded for both pre- and post- crisis for emerging market currencies, suggesting that the advanced economy experiences are not generalizeable. In part, this might be due to covered interest parity not holding as a result of capital controls. Or, the relative importance of monetary vs. real shocks might be the culprit. These issues will be the subject of further research using this data set.